The “Double Tory Revolt” report a few days ago by Roger Blaxall of QLocal was reminiscent of the apparent bravery of Sam “Pick up thi Musket” Small of the First Foot Guards at Waterloo? Mayor Neil Furey was “blasted by local councillor Sam Currrie” after a motion was put forward by the Labour group to accept a new Vice Chairman for a committee post previously held by Cllr Pryce-Roberts. Tory Cllr Currie Able Seaman RN Rtd questioned the decision and asked if it had anything to do with her poor attendance at meetings or her career as a senior lecturer at Southampton University. Not just any plain dry as dust lecturing but Senior Lecturer in the Warsash School of Maritime Science and Engineering. And, she worked as a lawyer and before that in a number of operational and managerial roles for A.P. Moller/Maersk Line and Hamburg Süd. Not to mention her extensive experience of lecturing and running programmes at Liverpool John Moores University and lecturing in Greece and Iran. Teaches BScHons Maritime Business, BScHons Maritime Law and Business, MSc International Maritime Law and Business, MSc International Shipping and Logistics, just to name part of her expertise. Published author of ’15 Years of Shipping Accidents”. 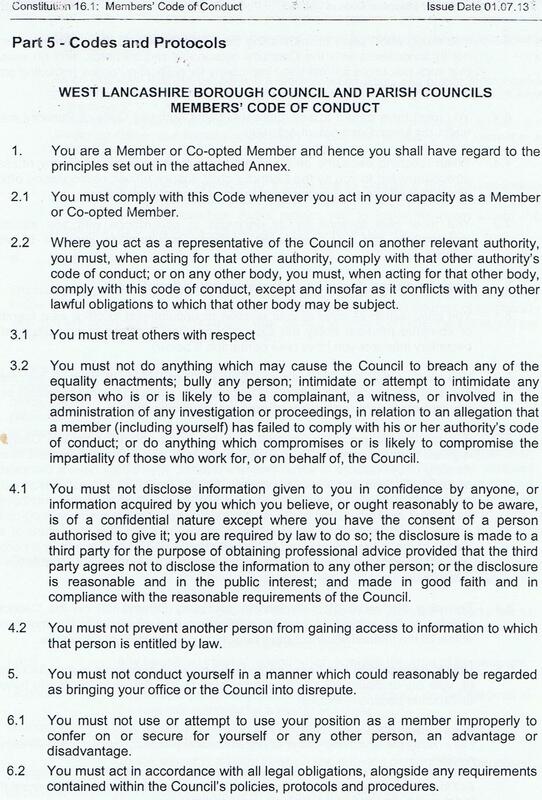 Bearing in mind the WLBC Code of Conduct training programme a few weeks earlier at enormous expense paid to Geldards Law Firm that Sam may have attended but was probably the recipient of their 170 or so pages of advice on how to behave, especially “you must treat others with respect” click to read, did Sam have a rush of blood to his head? 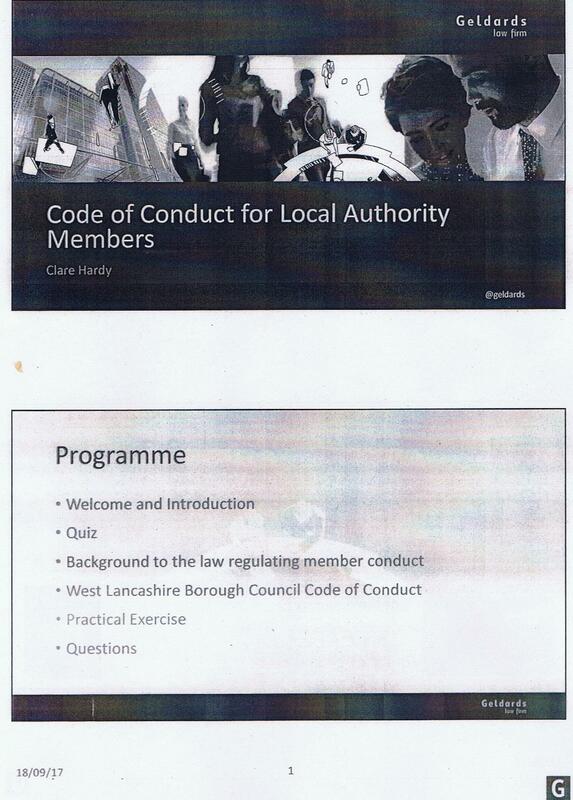 “The good people of Skelmersdale South have a right to know who their elected member is [they’ve known since 2010] and as I stated on Wednesday before I was ordered to keep quiet, Cllr Pryce-Roberts should declare how much time she actually spends in West Lancashire. As for Cllr Furey’s “get my solicitor involved” comment I say “bring it on”. If speaking out against undemocratic members gets me into a spot of bother then so be it. My only concern is for the people of West Lancashire. Not for the feelings of the mayor or indeed any other elected Labour member”. Read that again “My only concern is for the people of West Lancashire”…so much concern he walked out on the people of Aughton & Downholland he allegedly represents at Full Council. So let’s see if in the fullness of time someone has the balls to take legal advice on what if any spot of bother Sam is in.